The Skeleton Coast has featured in both Wilbur’s real life adventures and those of his characters. Below, discover why this stretch of Namibian coastline is so morbidly named. In The Burning Shore Michael Courtney's lover Centaine is shipwrecked on the forbidding Skeleton Coast of Namibia. This wild and mysterious stretch of coast originally got its name from the numerous piles of whale bones that littered the beaches in the days when whaling was practiced off this part of Africa's south west coast, but the description is equally apt today as the shoreline is peppered with the skeletal remains of numerous shipwrecks that lie half buried in the sand, testifying to the hazardous nature of the coast here. A constant heavy surf runs parallel to the shore, making landing on the beaches difficult and launching off almost impossible. For much of the year the area is covered in a dense fog caused by the cold, swirling Benguela current, which flows north along the coast chilling the air above it. This treacherous combination of strong currents and poor visibility creates conditions so dangerous that more than 1000 ships have come to grief here over the past 500 years. The most celebrated among them include the German cargo ship Eduard Bohlen, which ran aground in 1909, and the British liner Dunedin Star which was beached in 1942 after hitting a reef–all the passengers were eventually rescued but the tug that first went to their aid sank with the loss of two crew members–their graves on the beach are marked with a whalebone arch. 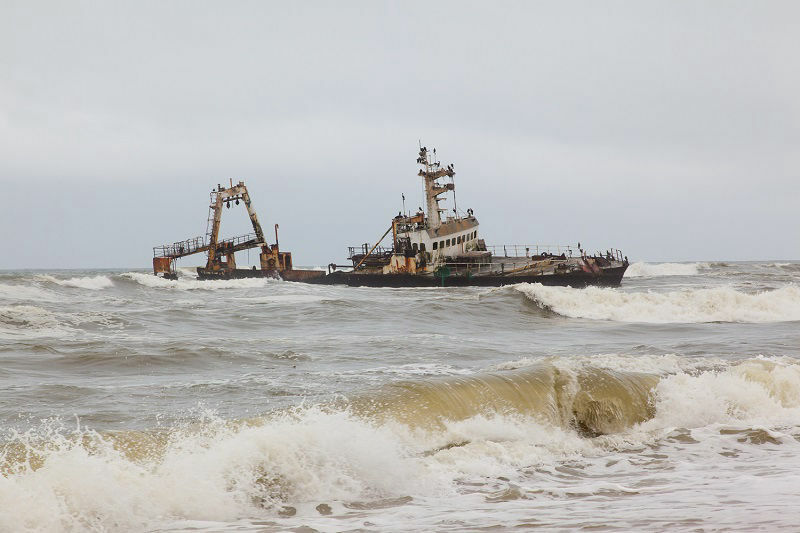 The first Europeans known to have sailed the waters off the Skeleton Coast were the Portuguese in the 15th century and they referred to the area as 'The Gates of Hell'. 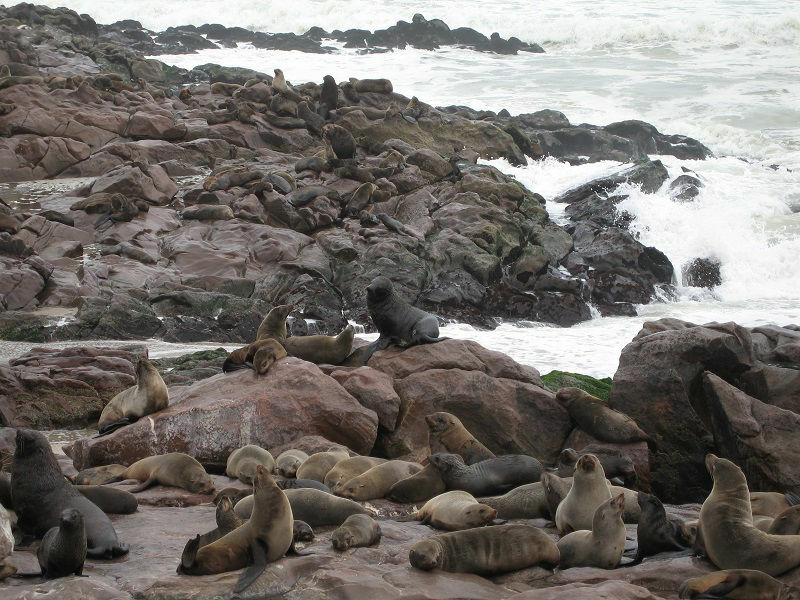 In January 1486 the Portuguese navigator Diogo Cão anchored off the Skeleton Coast beside a rocky outcrop that was home to thousands of seals, a welcome source of provisions for his crew. He went ashore and put up a padrão, or stone cross, inscribed with the words (in a rough English translation) 'In the year 6685 after the creation of the Earth and 1485 after the birth of Christ, the moist excellent and far-sighted King Dom Jao II of Portugal ordered this land to be discovered and this padrão to be placed here by Diogo Cão, knight of his court. 'The original padrão was taken down and removed to Berlin in 1893 but has since been replaced by two replicas. The rocky headland, now called Cabo de Padrão, or Cape Cross, is still home to one of the largest colonies of Cape Fur seals in the world. And the seals are not the only signs of life in this desolate place. The pungent smell of their colony attracts hyenas and jackals who prowl the beaches looking for dead seals and other carrion to feed off, all the while slaking their thirst by licking moisture from the stones. Over 200 species of bird have been recorded along the coast and the Kunene river in the north marks the southernmost breeding grounds of the Nile soft-shelled turtle. The Skeleton Coast is justly famous for its 'roaring dunes'. In certain places, if you move around on them, or there is a strong enough wind, the dunes produce a startling low rumble caused by the compression of the air between the particles of sand. The Bushmen call these the singing sands. The remote northern section of the Skeleton Coast is also home to Namibia's last surviving tribe of nomadic, pastoral people, the statuesque, red-skinned Himba, who live in huts made from mud and cattle dung. To keep their skin from drying out and to protect themselves from insects and the sun they cover their bodies all over with a paste made from ground ochre and butter that gives their skin a glorious red patina, a sign of great beauty. Their age and marital status is indicated by different hairstyles. Married men cover their heads in a style of turban which they never remove while single men have a plait. Young women not yet ready for marriage wear plaits that obscure their faces while women of marriageable age tie their plaits back from the face. Married women adorn their hairstyles with a head-dress made from animal skins. The remaining Himba population is thought to number about 50,000. In order to preserve the Himba way of life and the unique nature and unspoiled beauty of the Skeleton Coast only 800 people are allowed to visit the northern section every year, and only on official tours. The southern section can be visited year round but trips are regulated.